It's official, the second run of The Music of the Lord of the Rings Films has now been ordered! This may not be big news to anyone other than me -- after all, it should be a pretty seamless changeover for consumers -- but it's yet another testament to both the enduring quality of Howard Shore's incredible music and the remarkable insight and care that my brilliant collaborators brought to this book. Thank you, one and all ... and here we go again! Op 4 en 5 juni 2011 brengt het Rotterdams Philharmonisch -exclusief in Nederland- een waar spektakel ten gehore. 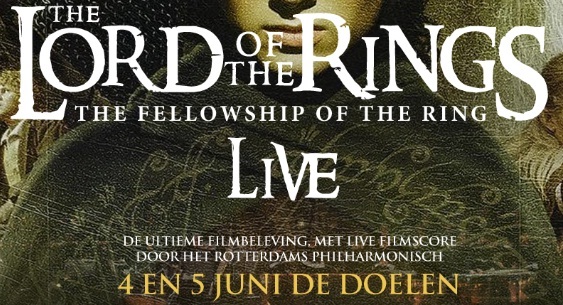 In de Grote Zaal van De Doelen wordt op een reusachtig scherm de verfilming vertoond van Tolkiens epos The Lord of the Rings: The Fellowship of the Ring. De muziek die Howard Shore voor de film componeerde wordt gelijktijdig uitgevoerd, live op het podium, door het Rotterdams Philharmonisch, het Groot Omroepkoor en het Nationaal Jeugdkoor. On June 4 and 5, 2011, in the Netherlands a true spectacle will be heard. 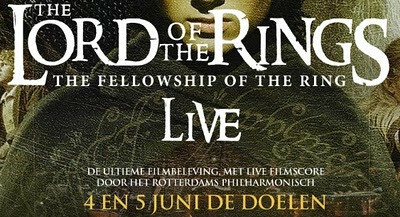 In the Grote Zaal van De Doelen, on a giant screen showing the film version of Tolkien's epic The Lord of the Rings: The Fellowship of the Ring, the music that Howard Shore composed for the film is simultaneously performed live on stage by the Rotterdam Philharmonic, the Netherlands Radio Choir and the National Youth Choir. I'll add this to the Performance Calendar as soon as I'm back home. I'll also try to fix the Google's butchered translation if anyone out there has suggestions! In the meantime, check out the well-made official site. As if the past days hadn't already delivered enough good news, Film Score Monthly Online has just gone live with its 2010 in Review issue. I'm incredibly honored to find that The Music of The Lord of the Rings Films has earned a number of mentions, and that I was named as one of FSMO's Film Music People of the Year. "This wonderful book is indispensable for fans of the films and students of movie music itself. Elegantly researched and written, smartly organized and beautifully published ..."
"[T]he finest film music book ever published ... "
Every now and then, a rising star reaches a pinnacle so significant that you just know the mark they leave will last for generations. This year (and we don’t give this award every year) probably belongs to Doug Adams, whose excellent analysis and tribute to the work of Howard Shore marks a significant milestone in film music criticism. It may have taken seven years to gestate, but the time allowed Adams to refine his approach to the material, carefully paring away potentially distracting elements that might have stolen the focus from the music itself. I'm moved. Film Score Monthly gave me my very first professional break of any kind, and served as my introduction into the inner workings of the wonderful world of film music. Today it is home to some of the very finest and most perceptive writers in the field, and I'm honored to be associated with them. Kyle, Jon, Al, Saul -- and as always, Jim and Tim: thank you, guys! Incidentally -- and probably more importantly -- Howard Shore's brilliant work on both Edge of Darkness and Eclipse is mentioned several times in the issue as well. Congrats, Howard! "It speaks to the longevity of the “Lord of the Rings,” films that ten years later, movie tie-in books are still being released. It speaks to the power of Howard Shore’s soundtrack and author Doug Adams presentation that “The Music of the Lord of the Rings Films,” is the best LOTR movie-related book and worth the wait." "Adams, with this book, sets a standard for film books, fan-friendly publications and music scoring aficionados all at once. It succeeds on every level and can rightly claim the labels of “magnificent,” “masterpiece,” and “landmark” without any pretense. It will remain relevant and appreciated as a companion to the films and the score and Tolkien’s original work as long as they remain." I am genuinely moved. Read TheOneRing.net's full review of The Music of the Lord of the Rings Films right HERE. Counterfeit alert: Please be advised that the performances listed on THIS website are part of the fraudulent line of LOTR concerts that have plagued Europe for the past few years. The music featured in these concerts is not authorized by Howard Shore. 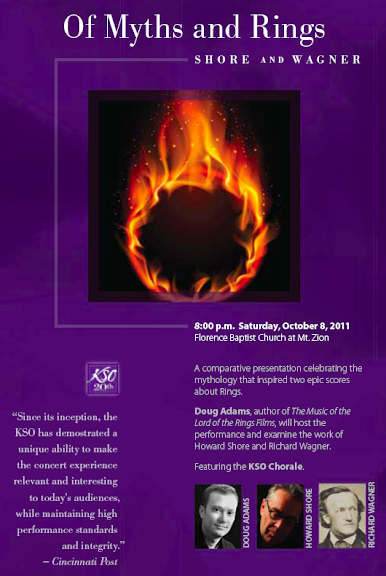 Despite advertising to the contrary, these concerts do not feature Shore's genuine music from The Lord of the Rings. These are nothing more than take-down approximations that have been "improved" by inaccurate, cut-rate arrangements. For serious fans of Shore's LotR music score. Five stars aren't enough for this book ~ I give it a galaxy of stars. Without doubt the best book I've added to my Tolkien library this year, maybe ever. Under the slipcover, the book is bound in a black cloth cover with the elvish ring inscription embossed in gold. It's basically divided into two parts: Description of the major themes with musical examples, then a mavelously descriptive annotation of the scores for each of the three films. The rarities CD included in the back is filled with musical gems that have never before been released. I particularly loved the Shire/The Hobbits mock-up on the Synclavier and the sweetly poignant Frodo's Song that had originally been intended to be the last song of Return of the King until it was replaced by Into The West. Love love love love this book. I plan to spend many happy months poring over it with the Complete Recordings sounding in my ears. Did I mention it's also laden with movie photos and sketches by Alan Lee? Thomas Lenz' excellent German-based film website screen/read has just posted an interview I did with them late last year. The English version is up and running, the German version is supposed to appear later today. Thomas, in addition to being quite the film expert, is a very articulate film score buff, so I had a great time chatting with him. I think it shows in the final result. Enjoy! It is not very likely that a book on a classic musical score for a motion picture meets the interest of a broader audience. So one might think. But as true as that assumption has been in the past, it got proven wrong by „The Music of the Lord of the Rings Films“, a stunning examination of Howard Shore’s brilliant scores for the Tolkien trilogy. Written by Chicago-based film music journalist Doug Adams, the beautifully designed book is the result of intense research and years of work. Adams worked closely with the composer from day one, met the filmmakers, attended various scoring sessions and compiled tons of material. In our interview he talks in detail about how the book evolved, describes fan reactions, live performances and discusses the current state of film music in general. screen/read: Generally though you’ve been doing quite a lot of interviews, presentations and book-signings recently as the interest in your book is surprisingly huge and so much bigger than one would have expected considering the topic. Until now, books on film music actually appealed to anything but a broader audience but in your case things are of a profound difference. Did you expect such a wide span of interest? Doug Adams: It’s been really intriguing. I went out assuming that we'd have somewhat of a niche market consisting of a very small group of collectors with a very specific interest. And so it’s a wonderful surprise and really gratifying to see that people from a lot of different backgrounds and age groups care for this book. We have people that are interested in it from the music aspect, people that are interested from the Tolkien aspect and people that are generally interested in filmmaking. I think that’s very exciting. And then it’s certainly great for the art form that all of these people are not looking at film music as a very small specific interest but as a part of a bigger picture. 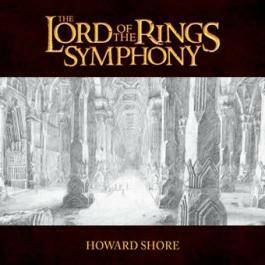 You know, it certainly is part of filmmaking, but it’s also part of the modern music world, and in its connection to Tolkien, the way that Howard Shore composed this, there’s a literary connection as well. So it’s great to see that it spans so many art forms and so many interests. What a year it has been, what a strange mood I’m in, why it’s almost … well, you get the point. Here at the outset of 2011 – ok, the third day since, per usual, I’m a bit behind – I, unsurprisingly, find my mind drifting back to 2010. The year began with an incredibly intense period of work, the likes of which I’d never known. Honestly, it was difficult, at times, to remember the end goal. It didn’t feel like we were working toward a book, necessarily. It just felt like each day began with a series of tasks – puzzles, or riddles, if you will, that had to be completed before sundown. It wasn’t art, it was survival. OK, that’s a tad dramatic, but the point is that the focus became so minute that I wasn’t seeing the forest for the trees, or the book for the pages. We knew what we were working toward, but somehow, seeing that first book on my porch in midsummer, all I could feel was shock. “How did this become a physical thing? How did the contents of my hard drive end up on my porch?” Sometime back in December I found myself in the music library of my old graduate school. There I stumbled onto the lengthy composition I wrote to complete my Master’s – the music school equivalent of a thesis paper. The feeling was much the same: “Why is this outside of my house?” This composition, however, had been quietly gathering dust as a single engraved document, wedged deep into a musty college library. Ah, the comfort of obscuro academica. The book … not so much. It was announced. It was expected. Good or bad, it was going to see the world ... and, in return, be seen by the world. As I sat in my office looking at the thing, a recurrent nag popped into my mind, a phrase that had shaken me awake all throughout the production. “What IS this thing?” At its heart, this was a book about music from a movie from a book. I used to pitch the project by crowing, “No one has ever tried this before.” But the truth was, I didn’t really know that. Maybe it had been tried dozens of times, but no one wanted such a beast! Flash forward. Long story short, it seems people did want this. The book has been a huge hit for us. Our sales are approximately eight months ahead of projected schedule, but much more importantly, people have responded to the piece. Howard Shore's music is, I hope, better understood now. And, really, that was always the goal. The process of creating this book -- my efforts, as they were -- should never have been more than a sideshow to the main event. It was Shore's music that compelled me to keep working. That's not some ephemeral declaration of purpose, it's a very real statement. I wanted to celebrate his work and his achievement. I wanted to show how he allowed art and intellect to coexist so gracefully, and how he brought a world to life with pure sound. The second half of 2010 was a dizzying spin wherein the preceding was happily realized. I don’t know that I’ll ever experience anything quite the same in my life. Fear, realization, relief, and excitement all commingled and rang on a grand scale. And after a year of big moments, of course, my personal life paused for a quiet change that’s the most profound of any. I don’t broadcast my personal life too terribly often. Just my nature, I guess. And really, if you have a public life of any sort, you do have to draw the line somewhere. Broadcasting each morning’s breakfast dilutes one’s content pretty darn quickly. I ate a bowl of Captain Crunch this morning. There, now try taking the rest of this post at all seriously! ☺ Anyway, thank you all for your kind words and support. You made both Jill and me feel pretty wonderful. Now here’s the thing, as much as 2010 felt like a high watermark it was, in reality, just the gate swinging open. 2011 will see the second run of the book – later this month in fact. We also have some exciting plans that we’ll put into play once the second edition supplies begin to dwindle. We assume that will occur in another year, give or take, but at the rate we’re going, who knows! The LOTR performances will enter a brave new stage as full trilogy cycles begin to appear around Europe. And the US has a few surprises in store for it as well. You'll see! And of course, in the meantime, we’re gearing up to re-enter Middle-earth and begin work on The Hobbit films. I believe I’ve said this before, but we used to joke that the crew on The Music of the Lord of the Rings Films was like the last team left in Middle-earth. When we were done, we were supposed to reach for the light switch and lock the door behind us. And, of course, as soon as we had wrapped things up, a burly band of Dwarves came marching over the horizon. Anyway, I’m particularly excited to return to the research and hinting that launched this blog in the first place. You didn’t think I was going to make things too easy on you, did you? The number one concern I heard voiced at appearances this year regarded this very blog. Would it disappear with the book now complete? Nonsense! There’s more to report on than ever. So here’s to projects completed, projects ongoing, and projects just beginning. And, appropriately enough, a toast to Professor Tolkien as well, on this, the anniversary of his birth in 1892. This CD... words cannot describe the gross anticipation and successful delivery of these tracks! Jam-packed with 79 minutes of uncut material, it also includes a fantastic interview with Shore regarding the production processes of the music and a hint at the Hobbit which Howard appears to be returning to compose for. Where during The Fellowship Of The Ring, as Arwen summons forth the ford, the music fades out. Shore wrote an incantatory choir piece to accompany this and it is just excellent - it's included here within the original material expanse of a recording coinciding with the surrounding scenes from the film. An alternate thematic entry of the Gondor theme originally occurred at the Argonath's reveal camera pan, which as Adams emphasises, was replaced with the History of the Ring. Here the original version is offered in fresh reception. Arwen's Song, preformed by Liv Tyler who portrays Arwen in the films, is available in complete form with this release including an additional line sung by Aerosmith's lead singer's daughter. Another favorite is the Return Of The King Trailer score, which is unique in it's variation, building up to the final installment of the trilogy. The book is the perfect companion, and I commend Adams on a extremely erudite report on Shore's scores. Back soon with a belated year-end wrap-up and January's Ongoing Discussion board!